Nintendo Switch Online Service: Is it worth it? Nintendo Switch Online is Nintendo's upcoming subscription-based service that offers four major features that non-subscribers won't have access to. Depending on what you do with your Switch, it's either going to be the best $20 per year (or $40 per year for a family plan) you'll spend or not worth a dime. Do you play multiplayer online games? Probably the most important feature of the Nintendo Switch Online subscription service is online access. 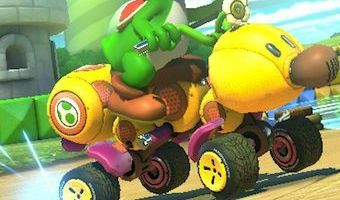 Right now, you're able to take advantage of this feature for free to play against other people around the globe in games like Super Mario Kart 8 Deluxe and Splatoon 2. However, once Nintendo Switch Online officially launches, you won't be able to play games online without a subscription. So if you're a multiplayer online gamer, the answer is clear. You'll want to put your money where your mouth is if you want to stay on top of the global leaderboards. Do you play games that allow you to chat with others? If you subscribe to Nintendo Switch … [Read more...] about Nintendo Switch Online Service: Is it worth it? Nintendo has a special service that Switch owners can subscribe to for a small fee, which gives us access to game-specific content within the Nintendo Switch Online app, online gameplay for compatible games, access to downloading classic Nintendo game titles, and special discounts in the eShop. Here's everything you need to know about Nintendo's online subscription service. What's new with Nintendo Switch Online? May 17, 2018: Nintendo announces the addition of cloud saves to the Nintendo Switch online service. Saints of Nintendo be praised! No longer will we have to live life on the razor's edge. No longer will we have to live in fear of losing fifty plus hours of gameplay. Cloud save functionality will be coming to the Nintendo Switch. The feature will only be available to those who subscribe to the Nintendo Switch Online subscriptions service but it's better than what we have right now, which is nothing. In addition, Nintendo announced that the classic NES titles which will be … [Read more...] about Nintendo Switch Online service: Everything you need to know!